Everyone knows a Michelle: the fanatic who deeply loves a few retail chains or local shops and wants to share everything she loves about them. After all, why keep the good news to yourself? Especially when you can save big. Michelle is the mostly anonymous blogger behind some of the biggest store-based couponing sites, including I Heart the Mart and I Heart Publix. If you already know about those, get ready to add I Heart Kroger to your reading list. The site’s simplicity and directness make it easy to pick up on some of Michelle’s saving skills. The stay-at-home mom has two hungry boys, and she is a super organized couponer. Do you shop at Kroger? Check out these five reasons to “heart” it! Those coupons that you receive along with your checkout receipt — and probably jam into your shopping bag without looking at them — come from a machine called a Catalina. I Heart Kroger keeps track of Catalina coupons spotted by shoppers, and lists them with their expiration dates. There’s a whole science to what purchases earn you which Catalina coupons at which stores, but the details are pretty overwhelming. If you simply want to know what might pop out next time you’re at the register, I Heart Kroger offers a simple method for staying informed. Ever skipped entering a sweepstakes, figuring you’d never win? This site will convince you to stop being lazy and enter every time. Each time Kroger offers a seasonal sweepstakes, I Heart Kroger lists the available prizes and the number of winners for each prize. If you knew 2,000 people were going to win a 2-liter bottle of soda or a free bag of candy, you’d want in on it too, right? So if you like getting free food for little effort, it’s worth keeping up with this site and entering when the time comes. I Heart Kroger knows that making a list helps you save money at the grocery store. The site makes it even easier to stay focused by allowing you to make, save and print grocery lists right on the site. It’s easy to add sale items to your list, which automatically tallies the prices and discounts. All you have to do is save your list and print it before you head to the store. Michelle offers a weekly deals post that neatly lists all the sale items at Kroger. It’s all sorted by store section (beauty products, produce, etc. ), and you can simply click to add the products of your choice to your shopping list. If there’s a special promotion, such as a What a Deal Mega Sale, she’ll have all the info for you. Michelle occasionally posts sponsored giveaways. But while some blogs go over the top to make products sound enticing, Michelle’s commentary is straightforward and family-focused. Entering a giveaway usually requires only a simple task, such as commenting on a Facebook post. Need a fix in between giveaways? 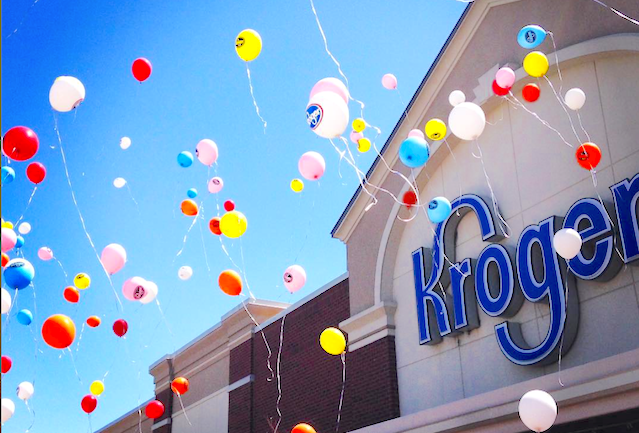 You’ll never miss another Kroger Free Friday coupon if you check I Heart Kroger on Fridays. A new free-product coupon is posted each Friday, but you have to act fast — the coupon disappears at midnight. You do, however, have two weeks to use your coupon in store before it expires. Your Turn: Do you read I Heart Kroger? How does it help you save money? Lisa Rowan is a writer, editor and podcaster living in Washington, D.C., a land not blessed with Kroger locations.